Wednesday, December 1 was the Greater Green Bay Convention and Visitors Bureau’s Holiday Reception at Tundra Resort and Conference Center. It was a beautiful party with a fabulous spread of delicious cuisine, fine local spirits and delightful treats. It was attended by many government and community leaders. Brad Toll, President and CEO, told the crowd that the Greater Green Bay Convention and Visitors Bureau was supporting the American Red Cross Lakeland Chapter as their charity this season! He talked about the humanitarian services the Red Cross provides including disaster relief, blood collection, service to our armed forces, healthy and safety instruction and transportation for 60+ and individuals with disabilities. He then announced that he was even dancing for this good cause in the annual Dancing with the Stars for the American Red Cross. 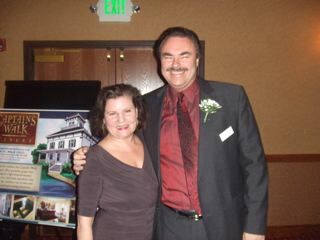 Just as Brad was saying, “Too bad there is no music”, the music came on and Janet Gollnick, owner of DanceSport of Green Bay, did a great impromptu cha cha with Brad to great applause. 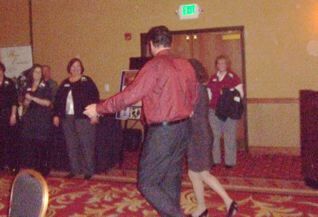 Our great volunteer, Barbara Vanden Langenberg brought a DWTS ballot box around and people could vote with their cash. Thank you to our star, Brad, DWTS co-chair Dawn Watry, DanceSport dancer extraordinare Janet Gollnick, Barb VandenLangenberg, the Greater Green Bay Convention and Visitors Bureau, and all attendees for all of their support for our Dancing with the Stars event, and for the vital mission of the American Red Cross.